Your Stamp, Your Way. Our Stamp Customization Process. Every rubber stamp on our website is fully customizable so you can get your stamp, your way. Our talented team of graphic designers has created classic designs but has made sure to also capture the latest trends. We can help find the right stamp body type and size for the impression you need. We have thousands of stamps to choose from! All you need to do is choose your favorite design, enter your personalized information, and submit your order. It’s that simple! We guarantee that your stamp or embosser will arrive just as you customized it. If there is any issue with your order, we will correct it! If you need a proof, please request one during your ordering process. 1. Your information is proofread and verified for accuracy. 2. It gets loaded into our specialty software and plotted along with the other designs in today’s queue. 3. Depending on your selection, your stamp will be laser engraved or created from polymer. 4. When your stamp die is made, our stamp craftsman assemble your stamp die on the stamper of your choice – whether this be a self-inking, pre-inked or traditional wooden handle stamp. 1. Self-inking stamps - 5 Benefits of Self-inking Stamps. Simply Stamps stocks the largest selection of stamp bodies on the market, providing the latest models of self-inking and pre-inked. We stock thousands of stamps from the top brands. Below you can read more information about each category. Looking for Help on How to Use your Stamp? See our Helpful Videos Here. Ideal: Ideal self inking rubber stamps have been a favorite in the marketplace for years. Ideal makes a great, all-around rubber stamper, built with quality in mind. 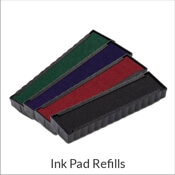 Die and ink pad replacements are very simple and most Ideal stamps offer multiple locking positions. The Ideal 400R is the stamp we use for most round return address stamp designs. 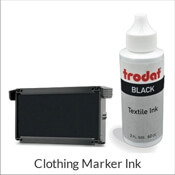 Trodat: One of the largest stamp machine manufacturers in the world, Trodat has brought many innovations to the market including carbon neutral products, mobile pocket stamps, colored rubber stampers & much more. Their latest designs are lightweight and easy to use, with an attractive and sophisticated look. Many of the rectangular stamp designs we produce, especially business logo stamps and address stamps, are set in Trodat Printy machines. 2000 Plus: Manufactured by COSCO Industries, 2000 Plus stamps are best known for their Green Line eco-friendly stamp machines which are made from 80% post-consumer recycled plastic and come in 100% unbleached paper fiber packaging. Max Stamp: Many of our customer's square designs are set in Max Stamp machines. These self inkers are best known for their transparent impression viewing window which allows you to see exactly where your stamp is being placed and lets you watch your stamp in action. Shiny: This manufacturer has been on the market since 1957 (almost as long as we have). Shiny originally started as a manufacturer of numberers and daters with their first self-inking stamp being developed and released in 1988. These stampers come in a wide variety of sizes. 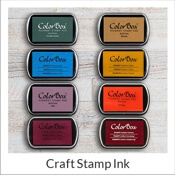 Like self-inking stamps, pre-inked stamps are refillable and come in a variety of colors and sizes. The main difference is in the quality and number of impressions each stamp provides. Pre-inked stamps use oil-based ink which permeates through the back of a specialized porous rubber. This process offers an excellent, crisp impression slightly superior to that produced by a self-inking stamp. Think of pre-inked stamps as the Cadillac of the Stamp world. Pre-inked stamps will also offer thousands of additional impressions before re-inking is required. The only drawback is that fast, multiple impressions (one after another) tend to fade as the ink needs a few seconds to be pulled through the die. MaxLight: These pre-inked stamps are used for our largest designs as they come in the biggest sizes while providing the same quality impressions as our other models. As we often say around here, if you're going big, go MaxLight. When most people think of a rubber stamp, they envision a traditional wooden handle stamp or wood block craft stamp. Most of our stamps come with the option to order as a traditional wood handle stamp. These types of stamps require you to purchase an ink pad, and will require you to re-ink the stamp after each impression. This is often ideal for crafting, but for frequent office and professional use, wood handle stamps are not the most popular style. If you're a paper crafter shopping for a new wood block craft stamp, see our designs today! Our team is constantly adding new themes and choices! Embossing Seals: Simply Stamps has a few go-to products that our customers order time and time again. Notaries and businesses tend to order our professional stamps but embossing seals are also quite popular for wedding, home décor, crafting, and personal use. Use our embossing seals for stationery and all your paper needs. They are solid, heavy weight construction and are not too bulky on your desk! Dater Stamps: Even in the age of "digital everything" and the move away from paper, offices are still using business stamps and dater stamps – especially when they feature custom text or logos. Simply Stamps has a wide selection of dater stamps, in various sizes to meet your office needs. Business Logo Stamps: We create thousands of logo stamps each month. Customers get excited about the opportunity to stamp their business logo onto thank you notes, letterhead, business cards, and other brand collateral materials. Business stamps are a cost effective way to market your brand and communicate your business identity. 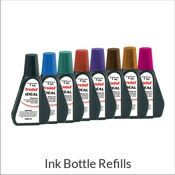 Inks and Ink Refills: With our pre-inked and self-inking stamps, you are sure to get a lot of stamp impressions (depending on the stamp, you’ll get 1,000 to 5,000 stamp impressions) but when you need to re-ink your stamps or buy a replacement pad, Simply Stamps has you covered. If you are looking for a particular ink color and don’t happen to see it, please contact our customer service department as we most likely have it in our warehouse.